By now, anyone in Fortean circles has heard of El Chupacabra. The creature has appeared on an episode of the X-Files, has it's on movie, and even has a killer song dedicated to it by the Wisconsin Fortean band, Sunspot. In March 1995, eight sheep were discovered dead in Puerto Rico, with three puncture wounds in the chest area, completely drained of blood. The legend of the goat sucker was born. Over the next few months, the modern mythological creature's victims grew and an eyewitness, Madelyne Tolentino, had the first sighting of the creature in the town of Canóvanas. The creature has been described as a reptile-like creature, with leathery or scaly greenish-gray skin and sharp spines or quills running down its back.Estimated to be 3 to 4 feet tall, it is reputed to stand and hop like a kangaroo. The creature's name, El Chupacabra, is attributed to Puerto Rican comedian Silverio Pérez. In addition to Puerto Rico, incidents involving the goat sucker were reported in the Dominican Republic, Argentina, Bolivia, Chile, Colombia, Honduras, El Salvador, Nicaragua, Panama, Peru, Brazil, United States, and Mexico. It should be noted that in 1975, long before the beast had its name, similar killings in the small town of Moca were attributed to El Vampiro de Moca ("The Vampire of Moca").These were at first blamed on a Satanic cult. Later, more killings were reported and many farms reported loss of animal life. While many investigated El Chupa, the most significant events in the story of this strange cryptid happened in 2011, when the beast was shot and killed in Texas. 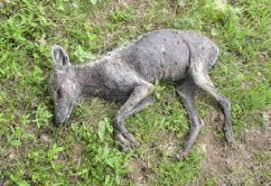 An examination of the corpse revealed what had actually been shot was a coyote with a severe case of mange. This has happened multiple times over the years. Benjamin Radford conducted a five year investigation of El Chupa sightings, documented in his book Tracking the Chupacabra. Radford concluded that this was a case of life imitating art-- Madelyne Tolentino;s description bore an uncanny resemblance to that of the creature Sil from the science-fiction horror film Species, released in the same year. University of Michigan biologist Barry O'Connor concluded in 2010 that all U.S. chupacabra reports were simply coyotes infected with Sarcoptes scabiei, the symptoms of which would explain the reported appearance of the chupacabra; little fur, thickened skin, and rank odor. O'Connor further theorized attacks on goats occurred "because these animals are greatly weakened, they're going to have a hard time hunting. So they may be forced into attacking livestock because it's easier than running down a rabbit or a deer." For a more indepth history of this modern mytholgical creature, listen to Episode #24 of the Fortean podcast "Otherside Podcast".